You know the questions visitors ask, “Where are the city’s hot spots?” Then there are the resident questions, “Where are the hot spots tonight?” Ideally, one ideal ‘superpower’ would be to visit every single venue in a city simultaneously to see what’s worth checking out. Citysense was invented for us mere mortals. 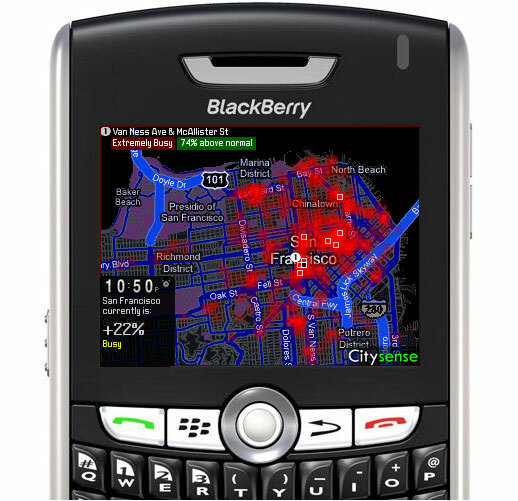 Built by Sense Networks for Blackberries and soon iPhones, the free application is based on the company’s Macrosense technology which analyzes existing data (e.g. demographics, weather, economic information, sales…) in real time.